In a mixing bowl, mix all the above ingredients together. Set aside for half an hour. Place 1 tsp of meat of filling in the middle of the wonton wrapper. Wet the edges with water to seal. 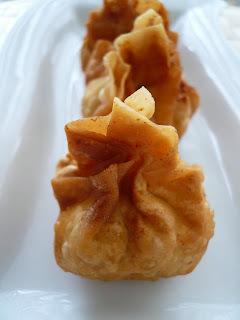 Heat up oil in a wok and deep fry wontons until golden brown. Serve with chili sauce or sweet and sour sauce. mmmm looks good! we love all types of asian foods. looks like i havea new blog to read. 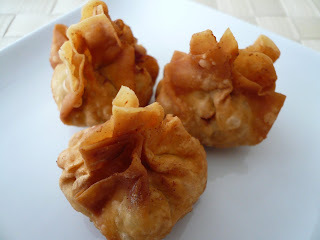 I love fried wanton with filling. My favorite is the rangoon cheese at chinese buffet. Thanks Debbie for dropping by. Zue, I prefer meat wonton than the cheesy one. I make if for you when you are here.